Your driveway and patio have end up so damaged that they are getting dangerously slippery? Order the services of Excellent Carpet Cleaning. We are a professional hard floor cleaning and jet washing company delivering first-class cleaning services in East Acton W3at an affordable price. We will gladly provide you with the specialist hard floor cleaning, scrubbing, polishing, anti-slip protection, sealing, tile recoat service you require. Call 020 3404 0500 or send us an online inquire here for a quick, free and non-binding selling price offer and discount info. Excellent Carpet Cleaning is a leading provider of professional hard floor cleaning, sealing, scrubbing, polishing, tile recoat and anti-slip protection service, tile and grout cleaning, restoration of porcelain and ceramic hard floors, vinyl floor cleaning, hard floor sanding service, stone and slate floor cleaning, floor sealing and polishing, grout colour sealing and recolouring services in East Acton W3. Our jet washing and hard floor cleaning and polishing services are perfect for all private and business residents of the region. We can clean and rejuvenate all kinds of outdoor and indoor hard floors for you. We use the latest professional cleaning methods, technology and Prochem certified solutions which are completely safe and sound for you, your pets and for the environment. Our cleaners come set up with the newest technology for pressurised cleaning, emulsification, heat,, and efficient capture of the waste materials. 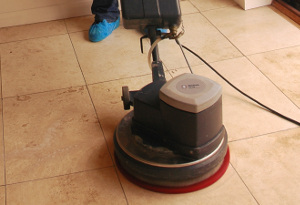 A specialized vacuum cleaner is applied to clean the hard floor area from any dust and debris. Any old sealant is taken out with professional floor polish stripping and sealant removal techniques. All stains, dull spots, watermarks and micro scratches are pre-treated and then a spray or other detergent is used for the cleaning and buffing of your flooring. During the stone or wood cleaning, any surface soiling is carefully eliminated. The cleaner may need to rinse, scrub and dry the flooring. Once the floor and grout surface have been professionally cleaned, continuing protection is achieved with an impregnator to keep it covered from soiling and stains. Our cleansing agents can clean your backyard hard floors via jet washing. We deliver first-class: patio cleaning, driveway cleaning and pressure washing. The outdoor cleaning contains - paths, decks and drives. So, no matter what type of hard floor you have. If you are in East Acton W3and require a competent jet washing and hard floor cleaning service, call us! We have a customer support service which will answer your call at 020 3404 0500 or your online booking request within two hours. You will receive written confirmation for the reservation. No deposit is necessary. You can book for the same day, or choose any other day for the appointment. Our prices are set, and we will offer you a big discount if you reserve more than 1 of our services to be delivered simultaneously.